Claire McCollum explores Northern Ireland. She meets a Christian geologist at Giant's Causeway and the Manchester United footballer who became a priest. 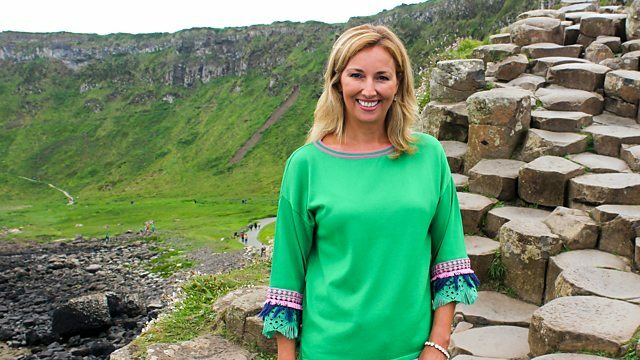 Claire McCollum explores Northern Ireland, beginning at Giant's Causeway - a Unesco world heritage site. She speaks to a local geologist who explains how the interlocking columns of rock were formed and how he marries his science with a deep faith in a creator God. JB Gill takes a ride around the Strangford Lough in County Down with a Christian cycling group. He's put through his paces on the narrow countryside roads and finds out from the team leader how cycling brings them closer to God. We also mark the 125th anniversary of the Girls' Brigade. Founded in 1893 in Dublin by a pioneering woman named Margaret Lyttle, Girls' Brigade aims to empower girls, develop skills, build friendships and explore the Christian faith. Groups now meet in 51 countries around the world and we drop in on a thriving company in Sunderland to see what it's all about. Claire meets Belfast boy Philip Mulryne who left professional football behind to become a Catholic priest. Philip was signed up to Manchester United as a teenager and had many successful seasons with Norwich City, but as he reached the end of his 20s he realised there was something missing. He tells Claire about his journey to finding fulfilment in the Christian faith which led him to the priesthood and even a vow of poverty. With traditional hymns and modern worship songs from across Northern Ireland including a performance from singer-songwriter Kathryn Scott. Dear Lord and Father of Mankind - St Macartin's Cathedral, Enniskillen. Claire speaks to local Geologist Mark Patton at the iconic Giant’s Causeway – a UNESCO World Heritage Site. He explains how the remarkable interlocking columns of rock were formed and how he marries his science with a deep faith in a creator God. JB Gill takes a ride around the stunning Strangford Lough in County Down with a Christian cycling group. He’s put through his paces on the narrow countryside roads and finds out from the team leader how cycling brings them closer to God. Claire meets Belfast boy Philip Mulryne who left professional football behind to become a Catholic Priest. Philip fulfilled the dream of many a youngster in Northern Ireland by being signed up to Manchester United as a teenager. After developing his game around the likes of David Beckham, he had many successful seasons with Norwich City and enjoyed all the trappings of fame and fortune but as he reached the end of his 20s he realised there was something missing. He tells Claire about his journey to finding fulfilment in the Christian faith which led him to the Priesthood and even a vow of poverty.